Although laser drilling has long been used for producing straight one-dimensional (1D) holes in glass, it generally cannot be used to form 3D microchannels since thin channels become clogged with the debris produced during laser ablation. This chapter describes two approaches that have been developed to overcome this problem. The first is femtosecond-laser-assisted wet chemical etching, in which femtosecond laser irradiation is used to modify the chemical properties of glass and subsequent chemical etching is used to selectively remove the modified regions. 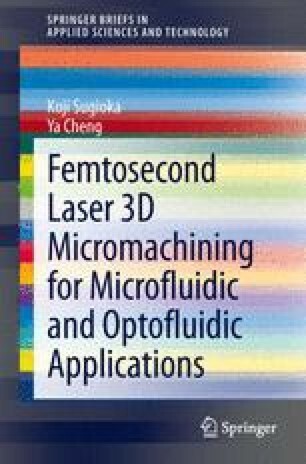 The second approach is liquid-assisted femtosecond laser 3D drilling in which liquid is flowed through the channels to greatly enhance the removal rate of debris produced by laser ablation. This chapter also discusses several beam-shaping techniques for controlling the cross section of the microchannels. The cross-sectional shape of microchannels is significant in many microfluidic applications because it determines the fluid dynamics and biological functions of microchannels.